Received the Too Faced x Kat Von D Ultimate Eye Collection from Sephora, and I am blown away by the shadows and lipstick in this set. I have never tried Kat Von D before, like ever, so I surprised myself when I tried the eyeshadows on and found myself really liking the look. Anyone who’s on my instagram would know that I usually stick to pink/peach shades (PLEASE RESTOCK THE SWEET PEACH COLLECTION. PUHLEEEZE. I say this with much urgency.) and red is far too dramatic for me, but, this look has grown on me and I think I could really get used to it. 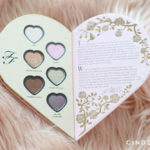 Anyways, in this post, I’ll be featuring the Kat Von D products that came in the collection, and I’ll follow up with the Too Faced side in about a week! This Kat Von D Everlasting Liquid Lipstick in XO is the bomb. It has, hands down, trumped ANY OTHER red shade I’ve ever tried. This bold, red shade has a slight tinge of cherry in it, from what I see, which is somehow super flattering. 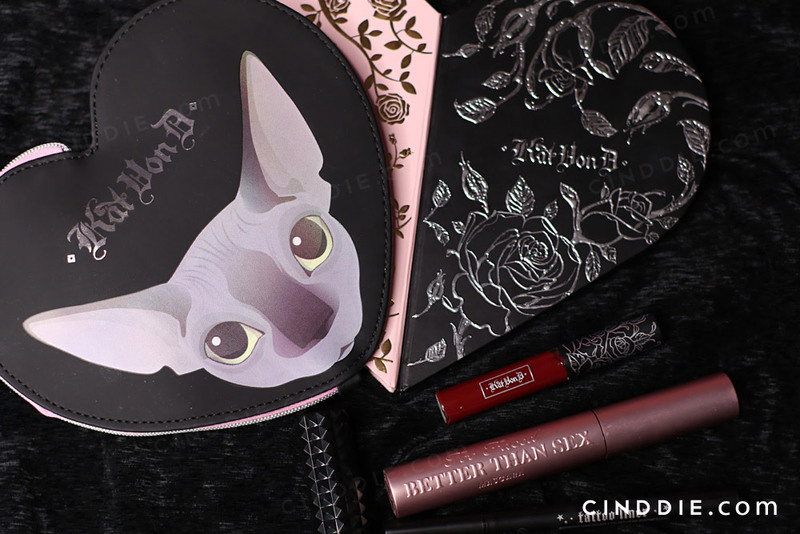 This liquid lipstick is part of the Better Together Cheek & Lip makeup bag set, which came in a super cute pouch featuring Kat’s cat, Piaf on one side, and Jerrod’s dog, Clover, on the other. Also, I can’t believe no one has ever told me how awesome Kat Von D tattoo liners are! The applicator makes it really easy to apply (no boo-boos! ), and the liner remained pretty much smudge-free the entire time I had it on. I’m still pretty surprised at how much I love the colors! So my favorite shades of the palette are Swoon (the red shade), followed by Lovestruck (the peach shade with gold shimmers). You would think that red would be difficult to pull off on the lids, but nah uh, somehow it isn’t! Swoon has a tinge of gold/terracotta to it, and the color payoff is AMAZING. Lovestruck, somehow doesn’t show up so well on my skin, so it is pretty subtle on me, which I love! Anyway, I loved the collection so much, I thought it would be fun to film a makeup video featuring two looks, using each side of the palette. Do give it a watch below, and let me know what you think! Don’t forget to hit ‘like’ and ‘subscribe’ if you like what you see!